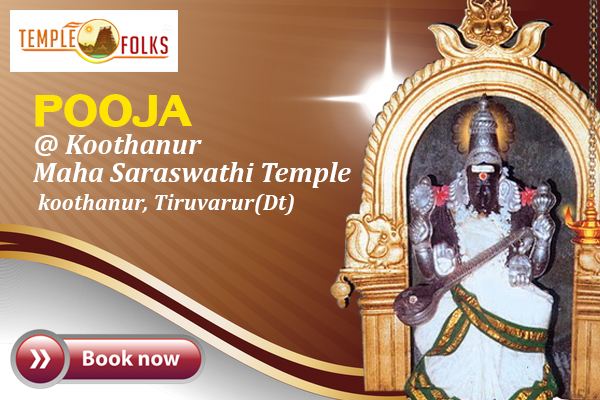 Koothanur Saraswathi Temple is located in Koothanur, Tiruvarur District in Tamil Nadu. The town is located at a distance of 25 kilometres from Tiruvarur. Very few temples in India is dedicated to Goddess Saraswati are seldom found in India. According to the history, King Rajarajachola donated this temple to Poet "Ottakoothar" because of his great creations of poems hence the temple is known as "Koothanur". The birth place of Ottakoothar is Koothanur. The Word Koothan describes the "Poet", Oor describes the "Village". About 1000 years ago before the birth of Poet Ottakoothan, this place was known as "Ambalpuri". Saraswathi is the Goddess of learning and wisdom. 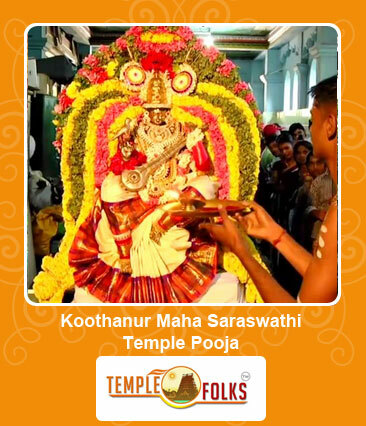 Goddess Saraswathi is also known as "Kalaimagal". The Goddess Saraswathi who is the consort of Lord Brahma is seated in a white lotus, attrited in white silk and is the embodiment of all grace, glory and divinity. Vijayadhasami festival is celebrated in Koothanur Saraswathi which is one of the most important festivals in this temple. For booking special Abhishekam choose the Additional feature option. Abhishekam process includes milk, tender coconut, sandal, Turmeric, Honey, Panjamirtham, Curd. Templefolks.com is not a temple agent. We will do pooja on your behalf to offer and deliver Prasad to your home. The amount will be used to buy and provide Prasad from the temple. And, to awning all assorted costs such as - Covering, Shipping and also includes all government taxes. Normally it takes 7 days you to receive this prasadam from temple, if you are outside India it takes 15 days to receive your prasadam.